Ever realised you’re going in the wrong direction and need to turn around? Chances are you’ve had to do a three-point turn. What is a three-point turn? Why do I have to learn how to turn in the road? Do you have to signal for a three-point turn? How do you do a three-point turn in an automatic car? Will I need to do a three-point turn on my driving test? The three-point turn is a method of turning a vehicle around in the road. It’s the standard method used to turn a car to face the opposite direction in a road that’s too narrow to complete a U-turn. 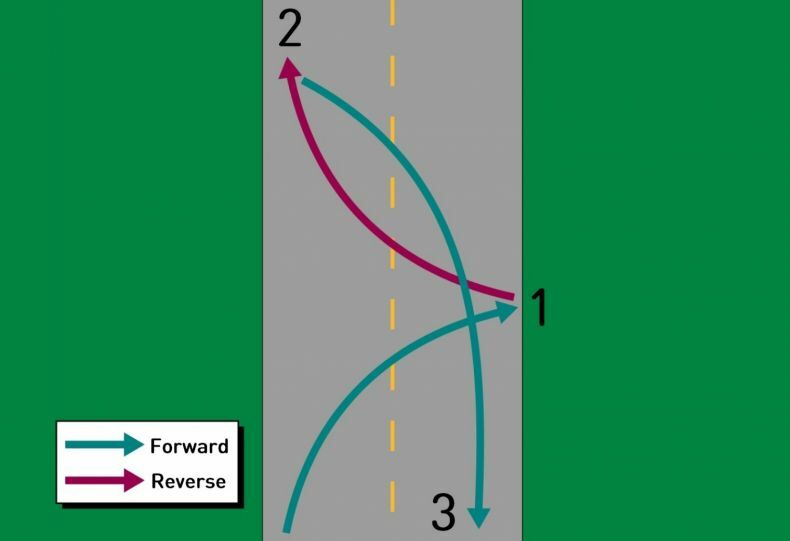 A three-point turn (sometimes referred to as a two-point turn or “K-turn”) is officially called “a turn in the road” because on certain roads the safest way to turn may include more than three points. In case you hadn’t noticed, many of the UK’s roads aren’t wide enough to do a U-turn, which means a three-point turn is sometimes your only option if you want to turn around. A three-point turn used to be included as one of the three possible reversing manoeuvres in practical driving tests until it was removed in December 2017. However, the ability to turn in the road is still an important driving skill to have. Assuming it’s safe to do a three-point turn, let’s go through it step by step. Identify the best location to do a three-point turn. This should be a wider part of the road, away from any junctions, driveways and parked cars. Once you’ve chosen the right spot to turn in, pull over to the left-hand kerb and check all around you using your mirrors — don’t forget your blind spot. If it’s safe to continue, indicate right (keep checking around you all the time) before turning your steering wheel all the way to right. Accelerate gently until the front of your vehicle nears the right-hand kerb of the road. Apply your brakes and stop the car around a metre from the kerb. This is the first point in your turn. Before moving again, check all around you in case other road users have appeared, before selecting reverse gear. 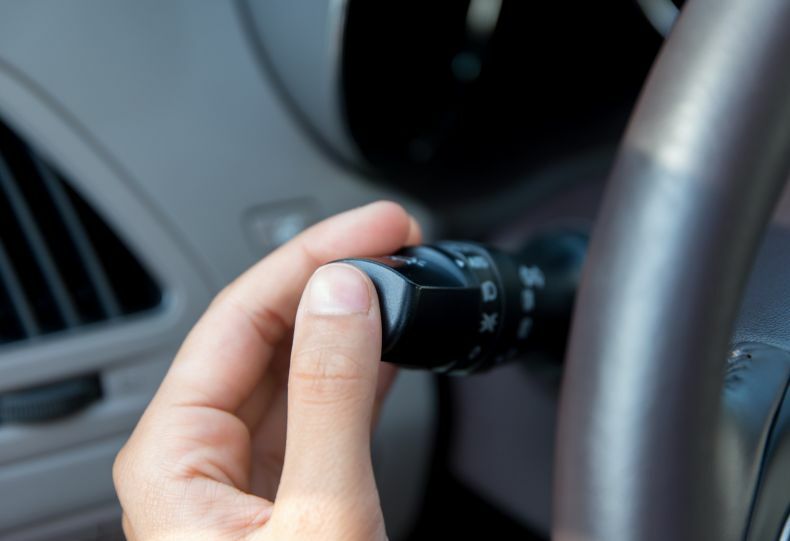 Once it’s safe to proceed, slowly turn your steering wheel to the left until it’s at full lock as you edge backwards towards the side of the road you started on. This is your second point. When you’ve reversed enough that you can drive forwards safely, stop the car and take another look around your vehicle for other road users. If it’s safe to do so, select first gear and move off, making sure you turn your steering wheel to the right slightly to help you straighten up quickly as you drive down the road. This is the third point. Performing a three-point turn can be daunting but if it’s done in a safe and controlled manner, turning in the road is an extremely useful manoeuvre to have in your driving repertoire. Sometimes, it won’t be practical to do only three points, and you may need more to turn safely. On other, busier roads a three-point turn won’t be safe at all. You’ll need to find somewhere else to safely turn around, like a car park or roundabout. Remember – this is a general guide and while the principles remain the same, you should always drive according to the conditions of the road you’re on. Before undertaking any manoeuvre you should always follow the golden rule — mirror, signal, manoeuvre. So after checking your mirrors, don’t forget to indicate right. Other road users won’t know you need to turn your vehicle round, so won’t be expecting a three-point turn. Give them as much warning as possible by signalling right for at least three seconds before starting your turn. In many ways, doing a three-point turn in an automatic car is very similar to doing so in a manual car. The only difference is that instead of selecting first gear before points one and three, you simply select drive. Automatic vs manual cars: which is better? There was a time when learner drivers used to worry about having to undertake a turn in the road under test conditions, but since changes were made to the practical exam in December 2017, a three-point turn is no longer in the test. Pull up in the right-hand side of the road, reversing for two car lengths and re-joining traffic.